A Dantian (Chinese: 丹田, pinyin: dāntián, Wade-Giles: tan-t’ien‚ pronunciation) is a centre of Qi (life energy). 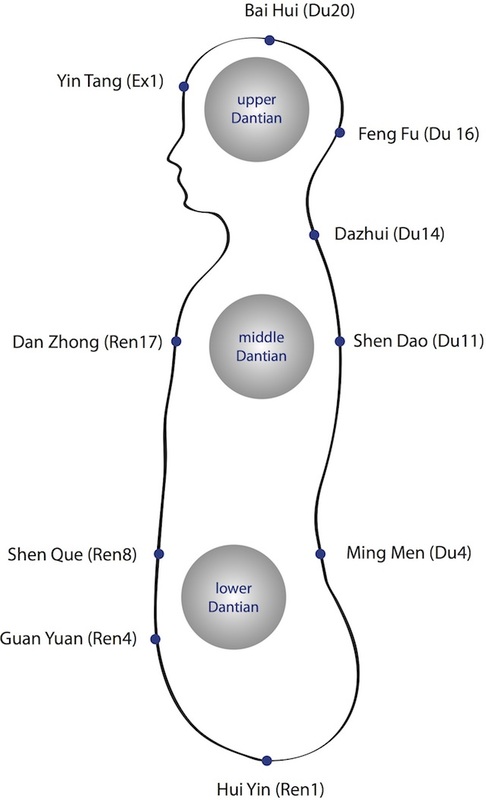 The Dantian are central points of reference in Qigong, Neigong, Taoyin (Daoist Yoga), internal martial arts and Traditional Chinese Medicine. Depending on the art and the focus of the specific exercise, breathing techniques and/or awareness are directed to one of the Dantian. There are three main Dantian: the lower Dantian, the middle Dantian and the upper Dantian. They represent the bodies’ functional and energetic centres of gravity. The term Dantian used by itself usually refers to the lower Dantian, which is the main energy centre. 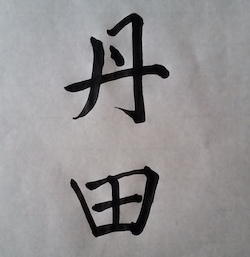 The Character for „dan“ means „elixir in the middle and depth“, whereas the character for „tian“ surrounds and separates four spaces: a (agricultural) field. Therefore, Dantian does not refer to a single point – it is rather an area, a reservoir. Put together, Dantian literally means „field of the elixir“. In Daoist alchemy the classic elixir is cinnabar, which was seen as precious ingredient for efficacious remedies. Neidan, the inner practice of Daoist mysticism, thus focuses on this „Cinnabar field“. Other Asian cultures also locate an energy centre in the centre of gravity, the „middle“ of the human body. In the Japanese tradition, it is called „Hara“. The „Chakra“ in Yoga are in some ways similar to the Dantian: both concepts share the idea of energy structures, which are related to different human faculties. The lower Dantian, for instance, is situated in the area of the Manipura Chakra, whereas its corresponding function can be likened to that of the Swadhistana Chakra as the seat of Prana. Although different schools describe the location and the specific function of the Dantian differently, three main Dantian are typically referred to. The upper Dantian lies between the eyebrows, the middle Dantian is situated in the middle of the chest area and the lower Dantian lies a few centimetres below the navel in the body centre. The three Dantian are where the Three Treasures (San Bao) – Jing (essence), Qi (energy) and Shen (spirit) – transmute. They are also figuratively referred to as „cauldrons“ in Qigong. The lower Dantian is the source of Qi, which is to be gathered and augmented there by means of the refinement of Jing. The lower Dantian is also the physiological centre of balance and gravity. 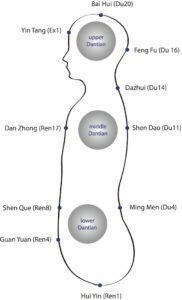 Biomechanically as well as bioenergetically, the lower Dantian provides the foundation for rooted standing, breathing and body awareness in Qigong and Chinese martial arts. Situated in the stomach area between the Sea of Qi (Qihai) and the Life Gate (Mingmen), it is the centre of instinct and intuition. Situated in the chest area, the middle Dantian is associated with Qi, i.e. with respiration and the health of the inner organs, the latter of which depends on the steady circulation of oxygen-enriched blood for optimal function and detoxification. In the terms of Daoist inner alchemy, it is described as the place where Qi is refined into Shen. Being at the level of the heart, the middle Dantian is also the centre of emotional life. The location of the upper Dantian at the forehead between the eyebrows is also called the „third eye“. The upper Dantian is connected to Shen, which is ideally transformed into wuwei (spontaneity/emptiness). The upper Dantian with its proximity to the brain is thought of as the centre of mental abilities and mentality.